Those of you who have watched our TED talk in 2013 would remember our wish for a drone that can remotely download images from camera traps in a forest – a ‘data mule’ drone. Fast forward to January 2015. ConservationDrones’ Lian Pin Koh had the honor of judging the inaugural Drones for Good competition organised by UAE’s Prime Minister’s Office. We are very happy to have helped pick a very worthy national champion – Wadi Drone. This is an entry from a group of sophomores from NYU Abu Dhabi who have developed exactly what we envisioned! What follows is a blurb from the four students: Martin Slosarik, Ting-Che Lin, Vasily Rudchenko, Kai-Erik Jensen. 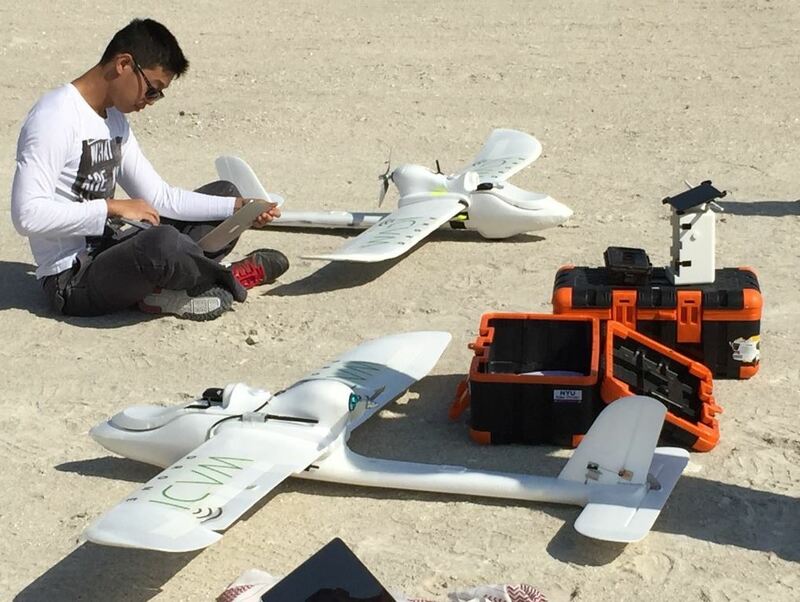 Our team from NYU Abu Dhabi collaborated with Wadi Wurayah National Park to create the Wadi Drone, a fully automated data-transmitting drone. Parks like Wadi Wurayah, a WWF site and a Ramsar Wetland of International Importance, all use camera traps to monitor wildlife and detect intruders. Many have also recognized the value of drone technology for aerial photography and mapping. The Wadi Drone is a hybrid that combines tested conservation methods like camera trapping with the efficiency of drone technology. It makes camera trap data available more quickly, more frequently, and at a lower cost than before. The Wadi Drone does not take photos or have onboard sensors. Instead it communicates with a conservationists’ usual tools–like camera traps–and makes hard-to-access data available without difficulty. A camera trap sits in a conservation area, automatically capturing and storing images of both wildlife and of poachers. These images are used by conservationists to monitor animal populations and protect the areas. However, collecting these images is an expensive, time-consuming, and dangerous process because it is still done manually. In Wadi Wurayah, with temperatures reaching up to 50 degrees celsius, rangers must ride a Blackhawk helicopter to reach far-away traps, just to download the images by hand. These images can only be retrieved twice a year with current methods. Even in temperate winter months, the 12,700 hectares of undeveloped mountains, canyons, and gullies provide beautiful vistas, but overburden rangers when they must travel up to three days for a single set of images. Launched from base camp, the Wadi Drone is a fixed-wing UAV using an Arduplane autopilot that connects from up to 250 meters in the air and wirelessly downloads images from camera traps in their usual locations. While circling overhead, the UAV can transmit hundreds of images in minutes with our proprietary transmission system. Our first prototype, which uses a Finwing Penguin airframe, was developed with attention to low cost, ease of repair, and reliability. During our first flight, we flew the plane autonomously inside Wadi Wurayah and transmitted more than 300 photos. Now, we are developing with larger airframes, but with the same low-cost consciousness, to obtain the desirable 40 km flight range. We have augmented existing Bushnell HD camera traps with our own transmission hardware. This battery optimized system keeps the microprocessor in sleep mode, drawing less than 1mA of current. This means rangers would only hike out to the traps once per year to change out the batteries. Meanwhile, this extended battery life still allows us to transmit photos every month. While we have shown this is possible on paper, we must continue large-scale testing to pin down exactly the longevity of the system in various conditions. Conservation Drone has already done excellent work putting the eye in the sky. Now Wadi Drone will reinforce the eye on the ground. In the conditions of Wadi Wurayah National Park, drones are the only technology that can feasibly facilitate the collection of camera trap photos. Together with Wadi Wurayah, we have already considered, and rejected, collecting this data with physical cables, cellular towers, satellite transmission and mesh networking of the cameras. All these options are damaging to the environment or very costly, or both. This system is not limited to Wadi Wurayah. Wadi Drone has the potential to aid conservation efforts worldwide. Wadi Wurayah has been the ideal proving ground for our technology because it is closed to the public for maintenance; meaning that it is safe to fly overhead. After further proving the technology here, we hope to radiate outward from this UAE locus and create a ubiquitous technology that will revolutionize the use of camera traps globally. We are doing our best to find the proper way to publicize the details of our system. Meanwhile, check out our brand-new website wadi.io and like our Facebook page to hear about future developemts! Wow, it is a great to see the drones for good competition held in Dubai. Thanks mate for such an amazing information. The future of drones is exciting to me. I can think the possibilities of future drones in our word. The drone will be true technology miracle. Cheers.